Department Recording Engineer, Jason Richmond, was the engineer for The Subject Tonight is Love by Kate McGarry, nominated for Best Jazz Vocal Album at the 2019 Grammy Awards! Jason has worked with Kate McGarry numerous times, and other top artists such as The Avett Brothers, Joe Henry, Branford Marsalis, The Steep Canyon Rangers, The Bad Plus, and Shirley Caesar. Read the full review below, and take a listen on iTunes. 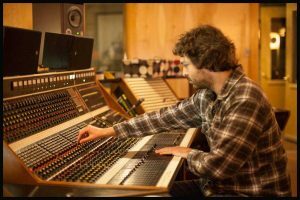 Jason Richmond teaches recording courses to music majors and mentors the department’s recording engineers, passing along his real-world experiences to the next generation. This semester Richmond is teaching MUSC 261: Music Production II, available to music majors and only by permission. These students learn the intricacies of not only recording but all aspects of sound engineering. Richmond also advises the department’s 5 student engineers who record important department events. Congratulations and good luck on Sunday, Jason!